American fell 53-49 to Army, dropping the Eagles to 4-13, 1-5 in the Patriot League. Here are the five key sequences/plays from the game. Finally home after a very difficult road trip, you would have expected the Eagles to come out sharp in a very winnable game. The opposite was true. The Eagles were dismal on the offensive end, starting 3-17 from the field — with very few good looks or attempts near the basket. They weren't better at the other end, as the Black Knights took a 20-4 lead with open 3s and layups. Down 25-8, the American offense finally woke up — thanks in large part to Mark Gasperini. The big man fueled an 8-0 run to close the half — that would extend to 13-0 to start the second — with an array of buckets inside, all while playing with two fouls. Gasperini struggled early to deal with the guys Army threw at him — said Army coach Jimmy Allen: "We just wanted to make it hard for him to catch the ball in the paint and then have to deal with some other guys kind of taking some swipes at it." — but he got the Eagles back in the game and has improved playing with two fouls. American knew Army would run. The Black Knights play at the 66th fastest tempo nationally and look to push at every opportunity. 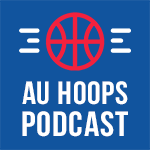 The Eagles got burned on a handful of occasions in the second half, particularly the two times AU took the lead. Watch how Gasperini scores but then can't get back to recover and loses his man, and then the next time when Delante Jones can't stop penetration and ends up fouling. The killer is the last possession where Gasperini is slow again and Army gets an open 3. Say this about American during the four-game slide: The Eagles have found a way to put themselves in a position to win with second-half spurts. Against Army, the combination of Jalen Rhea making 3s and Sa'eed Nelson's defense — two steals leading to buckets (Sa'eed is 11th nationally at 2.5 spg) — got American right where the Eagles wanted to be. Now could they close a game? While American as a whole has cleaned up its free-throw shooting since the Colgate debacle, Sa'eed Nelson continues to struggle at the line. He was 1-4 vs. Army — shooting all of American's free throws, an indication of the Eagles' inability to work the paint and get whistles — and missed the front end of a chance to tie the game with 49.4 seconds left. An Army offensive rebound later (off a miss that grazed the rim) and two made free throws, and AU's fourth straight loss was sealed. Sa'eed is now shooting 58.5% from the line on the season and has shot 46 more free throws (106 to 60 for Gasperini) than anyone else on the team.